Was Your Dog Sprayed by A Skunk? - Learn How to Get the Odor off Your Dog ASAP! Dogs are curious by nature and if you live anywhere near woods, fields, or farms it's only a matter of time before your dog gets sprayed by a skunk. Fortunately, you can get skunk spray off your dog in just a few easy steps. Before you jump in and immediately start trying to get the skunk spray off your dog (which is the first thing most people try to do), you will need to do a few easy yet important steps. If we got sprayed by a skunk, the first place we would go is to the bathroom to take a bath or shower. Likewise, this is where a large majority of people immediately take their dog after he/she has been sprayed. Do not bring your dog inside. You will get skunk spray all inside your bathroom and your house and will have everything within your home reek of skunk. Keep your dog outside until he/she is free of skunk smell. Skunks can carry rabies, so it's very important that you check your dog for any signs of a fight between the skunk and your dog. 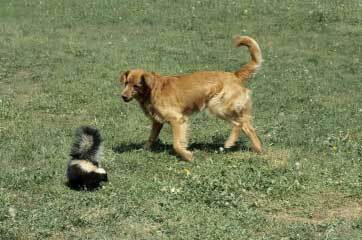 Rabies cannot be spread by the skunk's spray, but can be spread if the saliva from a skunk with rabies gets into a wound on your dog. So if you find any wounds on Fido, you need to call your vet and schedule an appointment immediately. Water will only make the skunk smell worse and more difficult to clean. Imagine how ineffective the skunks defense would be if their spray washed off in the rain...they probably would have gone extinct long ago. Skunk spray is an oily liquid which does not wash off with water. In fact, water only lubricates the skunk spray which allows it to easily smear and spread to other parts of your dog's body. If your dog was sprayed by a skunk more than a week ago, then it may be better for you to simply wait it out. If your dog is outside in a dry environment with little to moderate wind, the skunk spray will break down and disappear naturally within two weeks. However, humid and wet days can lengthen the amount of time it normally takes for the skunk spray smell to fade. This is what a lot of people try to do. Unfortunately, this can cause two possible problems. First, you will have to put your dog in your car to take them to the groomer and in doing so you will have a high risk of spreading the skunk odor into your car. The second problem is that pet groomers usually charge quite a bit to remove the skunk odor from your dog. They know you are in a sticky situation and are desperate to remove the odor, so their fees are usually fairly high. Home remedies are what most people initially use to get the skunk odor off of their dog. While home remedies can immediately remove skunk odor, it is hard to get the recipe correct. Most people end up receiving the wrong instructions from online forums and websites which make the skunk odor removal formula too weak or too strong which could harm you and/or your dog's skin. Get immediate access to all the top rated at-home remedies for skunk smell removal. These remedies are guaranteed to remove skunk spray from your dog and come with complete step-by-steps instructions on what to do so you can eliminate your skunk odor problems as soon as possible.